Laughing, he lifted the lid of a brown steel box, its hard lines unusual in a landscape of layered sand and rounded clouds. The tank rests on four metal legs, contains about 1,000 gallons of water, is filled twice a week, and is small enough to fit in the bed of a pickup. It’s located along the south fence guarding the 80-square-kilometer Oyu Tolgoi hard rock copper, gold, and molybdenum mine. Had the tank been set in one of the dusty towns in the South Gobi it would not have attracted much attention. The fact that it’s here — in a landscape of sand, tufted grass, and hot sun — and that it was brought here by Rio Tinto, one of the world’s largest mining companies, has turned the unadorned brown metal box into an object of regional significance, and perhaps a lesson in the new principles at work in 21st century water management and resource development. Last month the Oyu Tolgoi mine delivered the first shipments of concentrated ore to market, the product of an expanding open pit. The shipment culminated a decade of mine development and would not have been possible without the state-of-the-art water supply, treatment, monitoring, and recycling system that Oyu Tolgoi installed. priorities equal in importance as digging and processing the ore. The brown tank, though, lies beyond the closed loop. It is an outlier that is giving the mine’s leadership and a number of the region’s herders a shared headache. It is part of a much disputed water management project to divert the ephemeral rain-fed flow of a dry stream bed, the Undai River, away from the mine’s open pit. Right now, early in the mine’s development, the river’s dry channel skirts the pit’s edge. But as the mine expands over time and the pit widens, its southeastern edge will eventually meet the Undai’s path and the river’s waters will pour into the mine. Oyu Tolgoi set out to fix that problem by digging a new channel that bypasses the mine pit. But doing so also means halting the flow of water to Boor Ovu, a natural spring in the river channel that herders have used to water their livestock for generations. Newby and his staff proposed to fix that problem by developing a manmade spring several kilometers downstream and outside the mine’s fence line. The company’s consultants suggested placing the manmade spring 500-meters from the fence so that wild animals could take a drink. 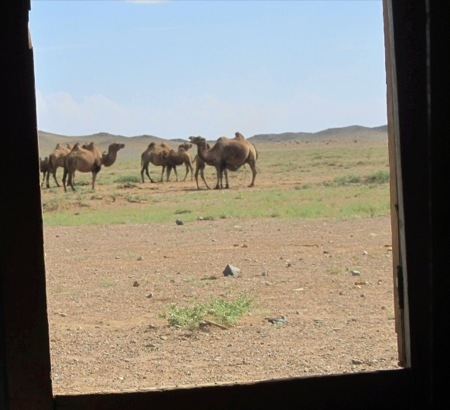 That spot is now marked by the brown water tank, which makes it a bit of an eyesore, and a summary of distaste for the mine and its effect on their lives that some herders here openly express. Local government officials also aren’t thrilled. The region’s governor recently stopped construction of the Undai diversion pending a review by a citizens working group of the manmade spring. Oyu Tolgoi had already built most of what was needed to change the river channel, and a year ago it closed the spring. Six weeks ago, the company completed the construction of wells and a pipeline that delivers the waters of the ruined natural spring to a spot in the Undai channel just outside the perimeter fence. The new wells provide a light stream of water to the riverbed. They also make the brown water tank superfluous. But the tank remains, heating up in the desert. Until its fate is decided it will attract attention and ridicule. On the day of my visit, Battsengel showed me the tank’s interior. Desert light reflected from the water surface. On the outside a stopcock valve and a faucet curved over the closest end of a steel watering trough. Battsnagel leaned down and turned the valve. Solar-heated warm water ran out, more brown than the desert sand. “Our new spring,” Battsengel said again. This time he wasn’t laughing. Almost 20 years ago, western mining companies began probing the mineral-rich ground of this part of the South Gobi, not far from the border with China. The main elements of the economy and human culture at the time were goats, sheep, horses, camels, and considerable financial stress. Mongolia was emerging from decades of socialist government and building a new market-based economy. Through all of the stress, though, herders here could count on having enough water, especially at Boor Ovu. The spring was almost sacred, said Battsengel, a place where mothers gave birth and children played in shallow water. The water’s temperature and flow also resisted the brutal Gobi winter and did not freeze until January. That made it possible to water livestock through some of the coldest months. Shutting off Boor Ovu’s flow and moving it south is viewed as more than an insult by some herders. They say it’s an outrage. On Wednesday this week Battsengel stood beside the mine’s tall, barbed wire-topped metal fence, and showed me the two wells that replace the natural spring. They produced a small stream of fresh water that drained into the Undai’s a dry river bed, generating a shallow and temporary pond. A hundred meters from the well the pond turned to mud. A bit further, the mud-dark surface vanished in the light brown sand of the Gobi. Perhaps at its core, there’s nothing terribly new about the basics of this narrative. The story of a big resource company pushing native people around is as old as western civilization. The United States, after all, was built with slave muscle and on land seized from Native American tribes. The U.S. industrialized in the late 19th and through 60 years of the 20th centuries without giving much thought to the consequences of its plants and their massive wastes to human health, land, or water. Except the brown water tank, the new wells, the local government oversight, and Rio Tinto’s responses indicate that resource development in the 21st century looks to be different. Just how different was displayed in full on Thursday here when Rio Tinto, the mine’s controlling partner, announced it was laying off 1,700 of its 5,000 Oyu Tolgoi mine workers because it has not gained national government approval for a $5 billion mine expansion. Battsnagel and the other seven members of Gobi Soil, their year-old non-profit, as well as their allies in Ulan Bator, can legitimately lay claim to having a tiny bit of influence in that decision. Here in Khan Bogd, a former herding town that has become a dusty mining town of perhaps 800 residents, the new rules of industrial development are in full view. With instincts and toughness honed by the desert, and with remarkable persistence, Battsengel and his herding friends here have been leaning hard on the owners of Oyu Tolgoi, and the local and national governments. They have been helped considerably by the national and global networking made possible by the Internet, and by technical expertise provided by non-profits outside Mongolia, particularly the Southwest Research and Information Center in Albuquerque. I’m traveling here with Paul Robinson, who’s worked at the center since 1976 and is one of the most expert mining policy and reclamation experts in the U.S. Paul is helping Gobi Soil understand the dynamics of drilling, soil, hydrogeology, mining, and reclamation. 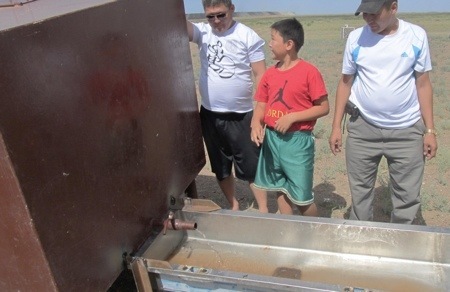 Gobi Soil’s goal is to significantly improve how the giant mine manages its water. They are making headway. The newly elected Democratic government earlier this year expressed concern about the $5 billion mine expansion, which involves a form of underground mining that, among other things, could leave a deep crater in the desert large enough to swallow most of Manhattan. Rio Tinto, faced with the government delay and softening of global metals prices, announced last week that they had put off the expansion indefinitely. Mines are an issue in Mongolia, arguably the biggest issue at the moment. This week, a member of the Mongolian Parliament held a news conference to report on steps his committee is taking to more tightly manage environmental protection measures in the mining sector. And prompted by a letter from Battsengel and the other members of Gobi Soil that critiqued Oyu Tolgoi’s environmental management and the damage they said it was causing to water resources, one of the mine’s largest global funders is convening a Compliance Assessment group. Among the presumed tasks of the gathering is for mine and environmental experts to review how well mine officials are adhering to water and ecological safety standards required by Mongolia and the international banks that financed the mine’s construction and operation. Gobi Soil receives a minimum of three seats on the compliance assessment panel. It’s not satisfied, and is calling for the same number of seats promised to the Oyu Tolgoi ownership group. What’s so clear to me after decades of reporting on these sorts of struggles in the United States, and more recently around the world, is that new norms are in effect for resource development in Mongolia. They are much different than those that operate in China and India, two other developing nations where I’ve spent time on assignment for Circle of Blue, and where we discovered massive disregard for communities, public health, and the environment. Here in Mongolia the principles and values of civic and economic fairness, and ecological safety, are alive. They reach more deeply into native communities, governments, and front offices than the world yet recognizes. The basic formula of the old 20th century debate, environment versus economy, seems to have evolved here. New ingredients are being added in the first decades of the 21st century to produce something important and nuanced. Caveats abound and will be included in upcoming reports for Circle of Blue. Still, success here has the real potential to be measured as much by ecological security and cultural longevity as it is by jobs and economic wealth. The desert south of Khan Bogh is a proving ground, and a lone brown water tank is its apt symbol. It’s where a tiny group of herders is challenging their national government and global mining companies to operate with new priorities. Both are responding. It’s where the world might see a developing country come close to actually achieving a new environmental and financial order.